1. Measure the length of the window opening along the window edge and the front edge of the opening Use the smaller of the two measurements. 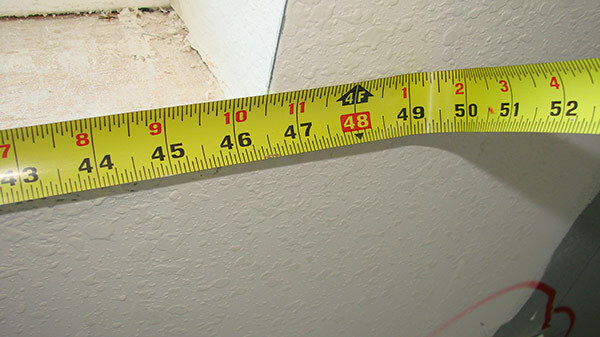 In the example below: the measurement along the wall is 46 1/2 inches as opposed to the measurement along the window which is 46 5/8 inches. We will use the 46 1/2 as our base number. Use this number and subtract 1/8 of an inch. This space is used for expansion of the material. and wall framing. 2. Measure the depth of the window opening. Remember, if tile or wall treatments are not installed at the time of measurement, you must add the thickness of the tile, thin set, etc. 3. Add 1 inch to your depth measurement for the edge of your choice. In this example: 4 7/8″ – 1/8 for expansion = 4 3/4″; plus 1 inch for edging equals 5 3/4 “. This will be your final depth measurement. To install your Corian or Hi-Macs window sill use 100% silicone. Apply 100% silicone liberally to the underside of the sill and press the sill firmly in place. Use a level to insure straight installation. Use clear 100% silicone to seal your edges or use a matching color to your grout, paint or window sill.